Editor: The following article by Matthew Wood is part of a continuing series in the OB Rag to place faces on our public servants who work for the residents and businesses of Ocean Beach. 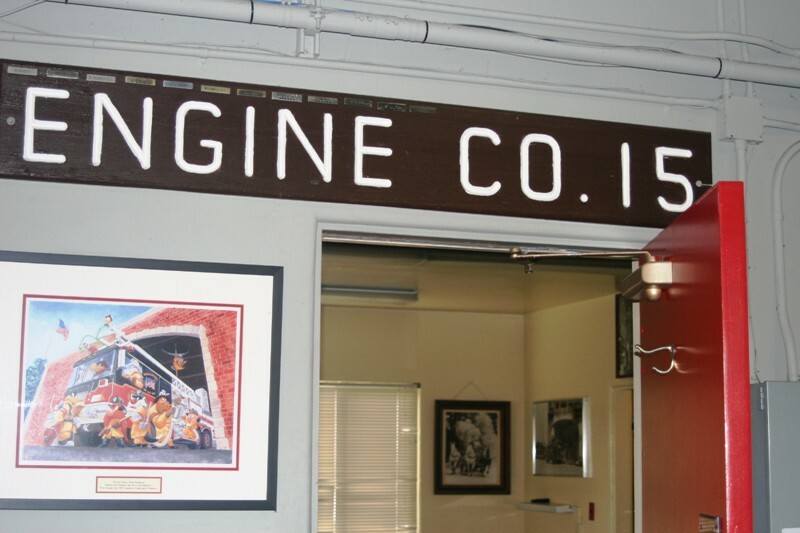 Growing up in the Ocean Beach area, Ryan Ybarra had a dream in life: To become a fire fighter at the OB Fire House No. 15. He waited for his opportunity, even enduring a hellacious commute from a job at a fire department the Los Angeles area back to his wife and kids in OB. Finally, about two years ago, a position opened up at the OB station on Voltaire and Ebers and Ybarra grabbed it. Didn’t matter to him that he lost the seniority he had built up. Or that he had to go through training and the department’s probation program. He knew he was home. 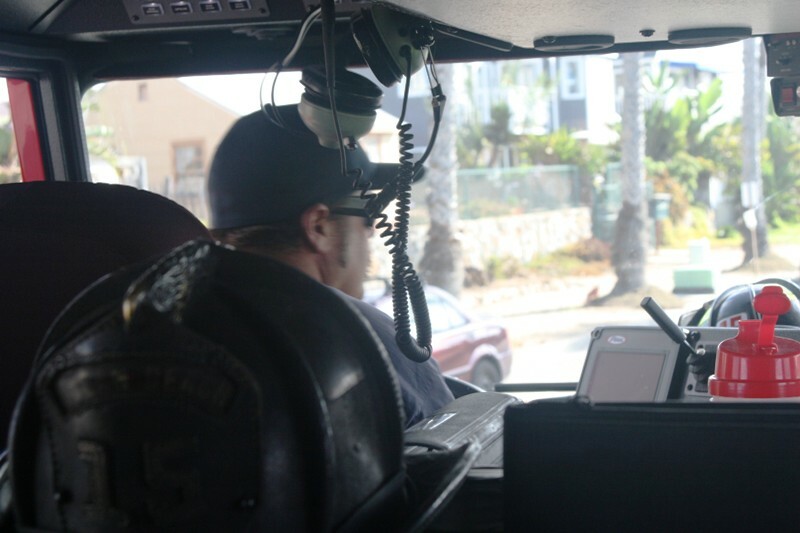 OB Fire House engineer Ryan Ybarra drives the crew’s fire truck through OB. 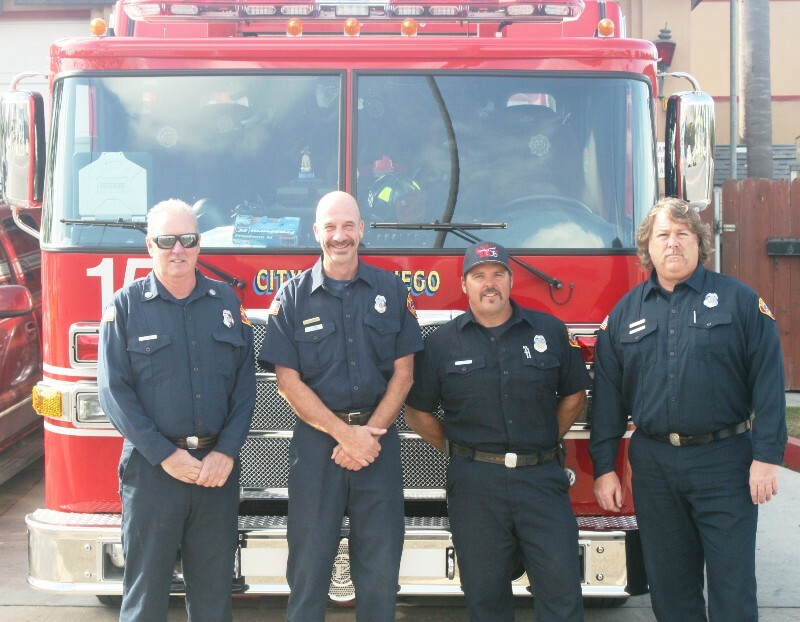 Ybarra is an engineer on the 12-man crew at OB fire house. The guys were nice enough to give me access to their daily routine, and even ride along in the fire truck to their daily workout regimen. The group that is divided into three divisions – A, B and C. They work on teams of four for 12-hour shifts starting and ending at 8 a.m. On an average month, each member of the crew works 10 shifts, averaging a 56-hour work week. Each member of the team has a specific role. The captain is the leader of the group and makes most of the executive decisions. There is also a paramedic, a fire fighter specialist and an engineer – Ybarra’s role – who handles any technical issues and makes sure everything is working properly. “My job is I gotta get them there safely and maintain the equipment,” Ybarra said. Joe Diko, the division’s captain, said the crew gets around five or six calls a day, taking them to anywhere in OB proper. It keeps them busy, but not nearly as busy as other fire houses in the city. A typical day starts with the crew exchange at 8 a.m., followed by a thorough house cleaning. Then they’re off to the beach for a mandatory exercise program. After that, it’s time to think about food, as the crews do all of the shopping and preparing of their meals. The afternoon hours are filled with training and fire inspections. The men get the evenings to themselves, until the inevitable calls start coming in. A vast majority of the calls are medical – more than 80 percent, Diko estimates. Sometimes an issue is not what it seems, like the recent late-night call the crew got about a potential plastic fire in the neighborhood. “Turns out it was a skunk. We get that a lot,” Barry said. Each member of the team deals with the tragedies in their own way, but they all rely heavily on the rest of the house. For Ybarra, it can be even tougher as a native to the area when he has to deal with people he’s known for years. He has seen a lot of people pass through the community, but not a whole lot of change. The biggest thing, he says, is the attitude of some of the younger, more transient residents. He says he has definitely seen gentrification kick in, much of it coming from business owners getting fed up with what he calls the “aggressive panhandling.” The guys know many of the homeless people by name, and can even tell who is involved just from the location of the call. But the calls on the other end aren’t all bad. The crew has delivered multiple babies, and one near miss. Diko recalls a recent incident where they were sent to the home of a pregnant woman. When they got there, the dirty work had already been done. The mother was alone in the house – at least, until she did the delivery herself. So the crew goes about their business and wait for the next calls, hoping for the best but fearing the worst. They wouldn’t have it any other way. Barry echoes the sentiments of all the men I talked to at the house when he says he’d rather be out on a call, even with the threat of injury or death to himself and others. Great article! The fire house and trucks always look immaculate. We are very lucky to have a great team so close! Thank you OBFD!!! Great Article Matt! These guys work hard and see a lot! Much respect! Didn’t every male child in America want to be a fireman? Well, Matt got to be one for a day. mister matt – this article makes me want to change from being a lifeguard – my dream – to being a firefighter. what gives? My son is also living the Firefighter dream as a Federal Firefighter and engineer at MCRD. My hat is off to you Ryan and all of your brethren. Thanks for all you do!! Ryan and crew came to my house several years ago when a visiting friend had an a grand mal seizure. Very frightening-I was so glad to see them. They were all awesome. Thanks again! Matthew – All your staff references were to “men”; were/ are there any women at all in the station? Is that common? Wanted to say, other than all the male gender heavy references, the piece is excellent, as it nearly caused me to tear up.